Behold! I have fashioned a magazine like those from fabled days of yore. It overflows with thrilling adventures. There are swords, and there is sorcery. There are dark deeds and daring rescues. There are lands where heroes fear to tread. Dare you imagine it? Picture this as well -- maps to wondrous and terrible places. Electrifying art for every tale. Guides to bring the terrors within to your own game table. All I lack are a few paltry shekels. Grant them to me, and I shall fling open a new portal to a world of ancient wonders! Join me, mortal dogs! Together we shall storm the gates of Valhalla! 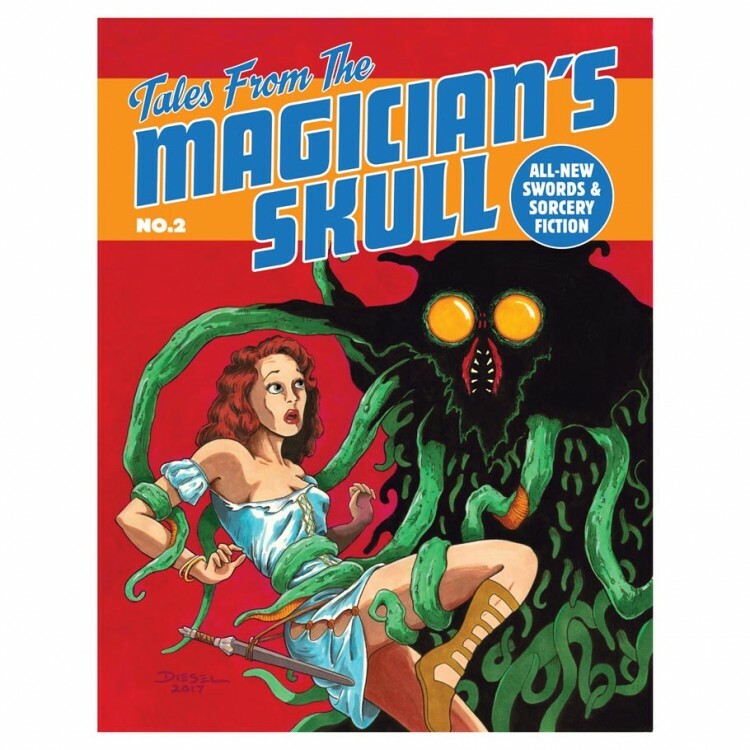 Tales From The Magician’s Skull is a magazine of all-new swords & sorcery fiction. Issue #2 features fiction by James Enge, John C. Hocking, Nathan Long, James Stoddard, Violette Malan, Dave Gross, and Setsu Uzume, with an illustrated adaptation of an Abraham Merritt story by Stefan Poag. The magazine is edited by Howard Andrew Jones and published by Joseph Goodman of Goodman Games. Each story is lovingly illustrated by industry stalwarts, and issue #2 features art by Jennell Jaquays, Doug Kovacs, Willam McAusland, Brad McDevitt, Samuel Dillon, Russ Nicholson, Cliff Kurowski, and Stefan Poag.